Flamingo Beach Resort & Spa today announced final preparations for its much-anticipated, multi-million-dollar rebranding. 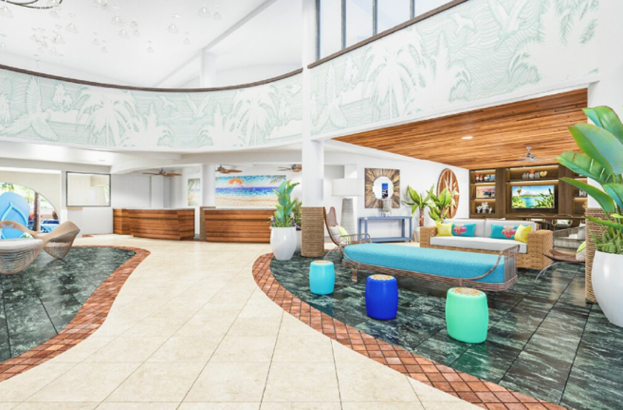 New project details and renderings have now been released of the new Margaritaville Beach Resort Playa Flamingo, which will debut with a soft opening on November 1. The rebranding will include a new modern design in all rooms and public areas, signature Margaritaville brand dining concepts, new activities for kids and adults, and more. Reservations are now available, with special soft opening rates and an early booking discount for travel in 2019. Guests will instantly be transported into a vacation state of mind as they are greeted by an all-new lobby with expansive views of the resort’s refreshed pool area – and beyond that, the pristine shores of Flamingo Beach. All buildings have been painted a crisp white accented with blue trim, and an enhanced driveaway with new water features will provide a welcoming tropical vibe. A 12-foot giant blue flip-flop sculpture is being added to the lobby, bringing a Margaritaville signature design element to the resort. Guestrooms will showcase a ‘casual-luxe’ design and soothing color palette, reflecting the brand’s inherent fun and escapism. Catering to families of all generations, the re-designed resort will now feature specialty Family Suites with bunk beds and more. Banana Wind Café, with locally-inspired dishes for breakfast, lunch and dinner, as well as frozen concoctions. License to Chill Bar, the new rendition of the resort’s famous swim-up pool bar, will now offer an extended menu for lunch, snacks and a variety of light bites along with its signature cocktails, beer, wine and other refreshing beverages. 5 o’Clock Somewhere Bar & Grill, serving up beach favorites such as burgers, tacos, seafood dishes and signature cocktails along with panoramic views of the Pacific Ocean. A stage will feature live entertainment multiple nights each week, and multiple large screen TV’s will keep guests up-to-date with all of their favorite sports. Capriccio’s Pizza Bistro & Café, the resort’s classic restaurant overlooking the pool, will continue to delight guests with gourmet pizzas, pastas and salads. An all-new indoor/outdoor kitchen has been added to facilitate poolside orders from License to Chill Bar, along with a new pool deck with additional seating. The interior of the new resort will provide guests a new look for the resort’s countless amenities, including a 24-hour fitness center and family center, and a theater room screening the latest movies in Spanish and English. The resort features three pools, one with the swim-up License to Chill Bar, a covered children’s pool, and an activity pool with a volleyball net; a spa; lighted tennis courts; a photography studio; a water sports center and an on-site tour concierge. Margaritaville Beach Resort Flamingo Beach will offer a revamped line-up of activities for guests including aerobics, aqua aerobics, dance, Zumba, Pilates, tai chi and yoga. Special activities will be designed just for kids, and babysitting services will be available. Unique excursions will be a big part of the resort experience, showcasing the best of Costa Rica, with day trips departing daily to popular nearby attractions and an on-site concierge to help guests decide what they will love most. Couples looking to exchange their vows against a back-drop of colorful flowers, palm trees and golden sand shorelines will find that Margaritaville Beach Resort Playa Flamingo provides the ideal wedding venue to say, “I do.” With a team of professionals readily available to turn wedding dreams into reality, the resort is giving couples a new fully customizable One Particular Harbour Ceremony Package. 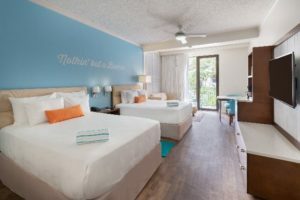 Travelers looking to escape to paradise and be one of the first to visit the new Margaritaville Beach Resort Playa Flamingo can take advantage of special grand opening room rates starting at $169 per night, for stays from November 1 through December 22, 2018. In addition, travelers can capture special savings for 2019 with an early bird discount of 10% off rates, valid on bookings by November 30, 2018 for travel from January 6 through December 21, 2019. 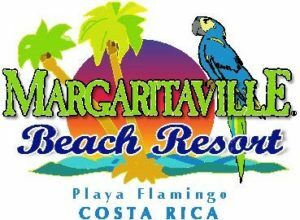 To make a reservation, or for more information, visit www.MargaritavilleBeachResortCostaRica.com or call 1-844-569-8851. Follow Margaritaville Beach Resort Playa Flamingo on www.facebook.com/MargaritavilleCR/, and @MargaritavilleCR on Instagram.